Does Benny Hinn realize the book he has "read and re-read over the years" and is offering to his viewers is a work of fraud? Benny Hinn claims to be a man of God, anointed by the Spirit to such an extent that supernatural healings and powerful manifestations of the Spirit occur at his meetings. In any case, as one who promotes himself as being so close to the Spirit of truth that he literally says “Good Morning” to the third Person of the Trinity at the start of each day, one would expect the Holy Spirit is guiding him into all truth in such a way that Hinn would recognize the stench of fraud a mile away. At the very least, given his high profile and the history of accusations leveled against him, you figure he’d fact-check the resources he recommends BEFORE recommending them to his world-wide audience! I’m speaking of the Archko Volume, a fraudulent work that is promoted by well-meaning ministers each year as an authentic historical resource validating the Gospel accounts. Which would be exciting if the Archko Fraud hadn’t once included a chapter plagiarized from Ben Hur, if it didn’t contain historical inaccuracies and actually contradict the Biblical account on a few points. 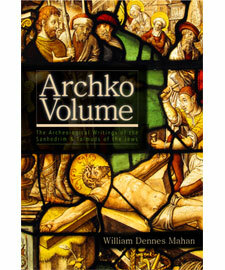 Each year around Easter and Christmas, I tons of inquiries on this site looking for information on the Archko Volume. In general, the Archko Volume is promoted by ministers who are not well-read and suppose they are giving their congregations a valuable historical resource validating the Gospel accounts! In the 1800s, Rev. W. D. Mahan learned about ancient Roman records concerning the life and times of Jesus Christ. That knowledge eventually led him to the Vatican. Among many other writings, he located a letter written on a papyrus scroll from Pontius Pilate to Caesar and records containing documents from Caiaphas the Jewish high priest, Herod Antipas, and others. Rev. Mahan’s remarkable findings were eventually translated into English and printed in his book, The Archko Volume, first published in 1887. Pastor Benny Hinn says, “This is one of the most unique books we have ever offered to you! Learn from the testimonies of both friends and enemies of Jesus of Nazareth that were found in ancient parchments and scrolls in Constantinople and Rome. You will read and reread this book, as I have done through the years.” Request a special-edition copy with your gift of $50. Realizing that Mr. Hinn’s television broadcast reaches 200 countries worldwide and has hundreds of thousands if not millions of viewers, I hastily contacted his organization by phone to see what could be done to prevent his viewers from being duped into reading a work of fiction as historical fact – especially one that actually contradicts Scripture on several points! Before I voiced my concerns, I asked the phone representative if she thought Benny Hinn had read the Archko Volume. She assured me that she thought he must have. After I explained that it was a fraud and that one originally included part of it had been plagiarized from Ben Hur, I asked her again if she thought Mr. Hinn had read this Archko Volume. She replied that she wasn’t sure but he must not be aware of the fraudulent nature of this work. Point in fact, the glowing review from BennyHinn.org quotes Mr. Hinn as claiming, “You will read and reread this book, as I have done through the years.” I was assured that a supervisor would call me back. No one from Mr. Hinn’s organization has contacted me. The ”anuman“ word arose because a line was skipped when copying this sentence. In 1885, W.D. Mahan was summoned before the Lebanon presbytery, found guilty of plagiarism and falsehood, and suspended from his position as a Presbyterian minister for one year based on the evidence brought against him. Mahan promised to withdraw the book, but instead published it again with major revisions, including the chapter stolen from Ben Hur. Mr. Hinn claims that he is so close to the Holy Spirit that he says Good morning to him everyday, that he has been anointed to heal through the Holy Ghost and that the Holy Spirit manifests itself in such power that when he waves toward the crowds they fall. He is no doubt then aware that it is the Holy Spirit who guides us into all truth [John 16:13]. Why then does Mr. Hinn promote the Archko Fraud to his international audience? will he make a statement to warn his followers of the grave error it represents? and who publishes this special edition of the Archko Volume? I have contacted Customer Service regarding this matter several times by phone and have been promised a return call by a supervisor. This has not yet occured; meanwhile, the thousands if not millions of Christians who trust Hinn’s advise are being mislead into accepting the Archko Fraud as an authentic historical authority. Since then I have pressed my case to a supevisor, who assured me that someone even higher up will give me a ring. Here’s hoping. Pray that Mr. Hinn sees the truth of the matter and has the integrity to not only pull the Archko Fraud from his shelves but also to admit to his viewers that he was wrong about it and to warn them of the horrible fraud it represents. As been pointed out that a para from Ben Hur has been plagiarised, what about the other contents? Can anyone say some things, as Iam curious to read it ,but before that i wan tot be sure. Even though I do not listen to Benny Hill, I think you are doing him a great service. The problem with success is often sincere pastors lose personal contact with parts of their ministry and depend on their helpers. Being human sometimes mistakes are made, better the blows of a brother than the flattery of an enemy. Hi Tony. Thanks for bringing this issue into the limelight. However I very much doubt that you will get any joy from Mr. Hinn or anyone else from his organisation. Why do I say this? It seems you are not aware that Benny Hinn is an evolutionist. I know this for a fact because I heard this from the horse's mouth. Some months ago I tuned in to the TBN network and saw one of the network founder Paul Crouch's sons - I think it was Andre Crouch - discussing Genesis with Mr. Hinn and a couple of other charismatic movement leaders. Mr. Hinn clearly stated his belief in the Gap Theory and the millions of years of death that this theory espouses between verses 1 and 2 of the first chapter of Genesis. And if I remember correctly, after being cautioned by Mr. Crouch that this was a contraversial subject, Mr. Hinn referred to the discription of the Fall of Adam and Eve as described in Genesis 2 as fiction or a myth. The fact that he is now promoting the fraudulent Archko Volume to make money should not come as a surprise to the discerning Christian. It is really tragic and unfortunate that there are many people out there claiming to be Christian leaders who are in touch with the Holy Spirit, have healing powers. speak directly to God etc. etc. but are in reality using the Christian religion as a business for monetary benefit. These people speak and sound BIBLICAL but are bereft of SCRIPTURAL accuracy. They prey on the gullible. the desperate and the ignorant just as the Pharisees did, but instead of revealing the Truth of scripture to their audience they twist the Word to suit their pockets. Isn't it ironic that what God said of how He created the universe and everything in it is pooh-paahed as mythological nonsense yet when a man like W. D. Mahan fabricates a story it is taken as gospel? Tony, keep up the good work of exposing and highlighting these issues. After all the apostles, especially Paul, Peter and John had to contend with the very same issues in their day and they, too, brought these things to the attention of the church so that the true believers would not be misled by false teachers.